FOR years Iran has practised denial and deception; it has blustered and played for time. All the while, it has kept an eye on the day when it might be able to build a nuclear weapon. The world has negotiated with Iran; it has balanced the pain of economic sanctions with the promise of reward if Iran unambiguously forsakes the bomb. All the while, outside powers have been able to count on the last resort of a military assault. Today this stand-off looks as if it is about to fail. Iran has continued enriching uranium. It is acquiring the technology it needs for a weapon. Deep underground, at Fordow, near the holy city of Qom, it is fitting out a uranium-enrichment plant that many say is invulnerable to aerial attack. Iran does not yet seem to have chosen actually to procure a nuclear arsenal, but that moment could come soon. Some analysts, especially in Israel, judge that the scope for using force is running out. When it does, nothing will stand between Iran and a bomb. The air is thick with the prophecy of war. Leon Panetta, America’s defence secretary, has spoken of Israel attacking as early as April. Others foresee an Israeli strike designed to drag in Barack Obama in the run-up to America’s presidential vote, when he will have most to lose from seeming weak. A decision to go to war should be based not on one man’s electoral prospects, but on the argument that war is warranted and likely to succeed. Iran’s intentions are malign and the consequences of its having a weapon would be grave. Faced by such a regime you should never permanently forswear war. However, the case for war’s success is hard to make. 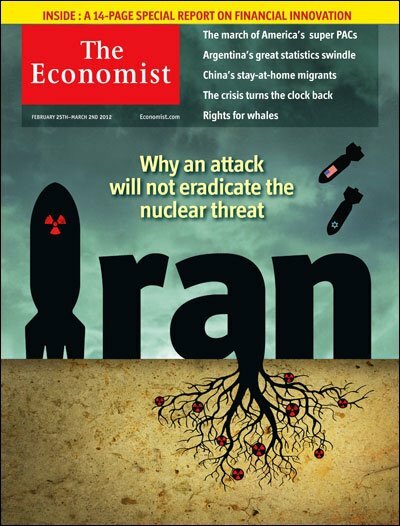 If Iran is intent on getting a bomb, an attack would delay but not stop it. Indeed, using Western bombs as a tool to prevent nuclear proliferation risks making Iran only more determined to build a weapon—and more dangerous when it gets one.